Located on the southern bank of the Red River, 35 km from Hanoi, Dong Ho folk painting village in Bac Ninh province is the cradle of wood carving and poonah paper paintings. Dong Ho folk paintings are famous both inside and outside Vietnam. Dong Ho village, also known as Mai village, is very small with no more than 200 households. Their main income comes from painting. Dong Ho paintings are the lively description of the beauty of the countryside and traditional customs and festivals. Since the 16th century, the making process of Dong Ho painting has been done manually, from making papers to woodcut printing. The craft particularly flourished from the late 18th century to 1944, during which all the 17 clans of the village made folk paintings. The market for Dong Ho folk paintings is particularly busy during the 12th lunar month, especially on market days on the 6th, 11th, 16th, 21st and 26th day of the month. People in Dong Ho village have a saying: “Wherever you are, remember to return to the village in the 12th lunar month to trade paintings”. 80-year-old artisan Nguyen Huu Sam displays thousands of paintings and woodblocks, which are some hundreds of years old, in his house. Sam has also set up a corner to introduce the process of making folk paintings from drying papers to the woodcut print technique. Sam said: “Previously, during Tet, Vietnamese people often decorated their houses with Dong Ho paintings to make the Tet atmosphere warmer”. Dong Ho folk paintings feature 180 topics in 5 categories: worshipping, history, blessings, daily use, and storytelling. Topics of the paintings include people’s daily activities and production. They portray legendary characters, landscapes, and activities that imply wishes for happiness, wealth, bumper crops and effective husbandry. Mr. Sam again: “Dong Ho paintings celebrate daily activities such as husbandry and wish for prosperity and success”. 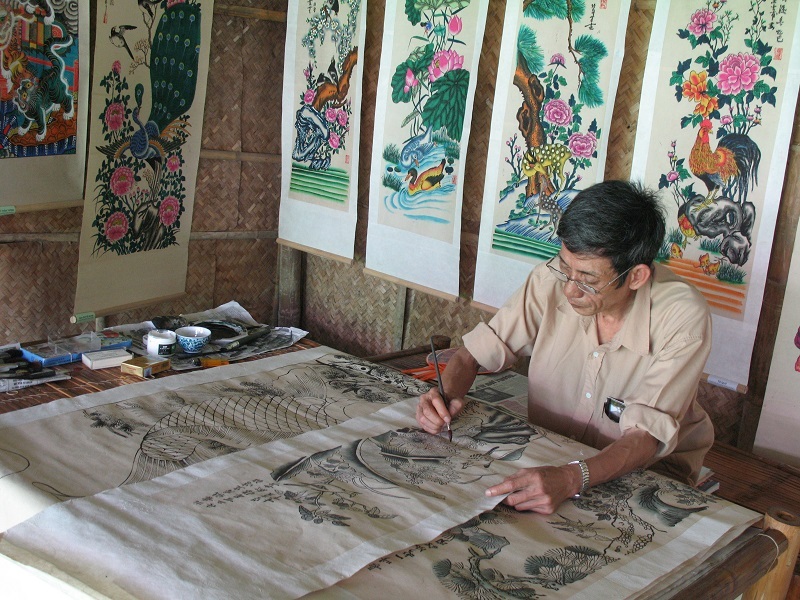 The paintings are created on woodblocks, and the techniques require highly-skilled artists. Woodblocks are used to create the main outline of the picture and the number of woodblocks used is equal to the number of colors in the picture. To produce a picture, layers of colors are printed without overlap in a precise order (red, green, yellow, white and lastly the black lines) so one picture needs several woodblocks each for printing the different colors. The designs on the blocks have to match each other in order to create a good picture so only experienced artists are in charge of engraving the designs. That’s why woodblocks are preserved as valuable assets by local artists. Mrs. Oanh again: “Woodblocks are made from decandrous persimmon trees, which are very durable and worm resistant. We have a number of ancient woodblocks. Before 1945, everyone in Dong Ho made paintings but after 1945, some changed to other jobs because the trade was not profitable. So, villagers donated their woodblocks to the Dong Ho Painting cooperatives. My father kept some of the woodblocks. We have now made about 60 kinds of ancient paintings and 60 kinds of contemporary paintings”. Nowadays, the Dong Ho pictures have inspired modern Vietnamese artists. They also provide valuable insight into Vietnamese folk art. Dong Ho folk paintings have become a specialty of the Kinh Bac region. Bac Ninh province is filing a dossier to nominate Dong Ho folk paintings as a world cultural heritage recognized by UNESCO.